It features a cast of celebrity actors---including the voice of Emmy Award-winning narrator Stephen Johnston---along with dramatic sound effects and a compelling musical score. 61 CDs, approx. 70 hours total. 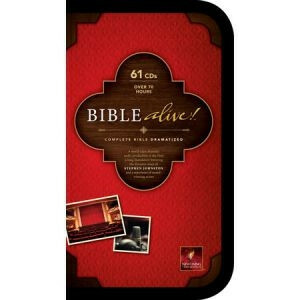 Bible Alive! lets you experience the New Testament in all of its magnificence and power, inspiration and intrigue. A cast of Tony, Emmy, and Golden Globe Award–winning actors, dramatic sound effects, and a compelling musical score are combined to create this unforgettable listening experience.